Osaka Boiler is a “well-established company” that began as a boiler manufacturer in the Taisho Period (1912-1926). Allow us to offer our thoughts on boiler production and craftsmanship that coincide with our advantages. 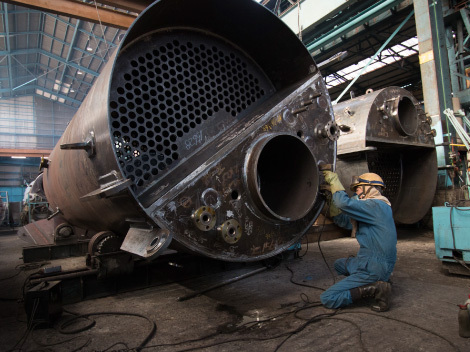 We specialize in the production of marine boilers and various pressure vessels for land use. All boilers utilized for vessels such as tankers, autoclaves and power-generating facilities for land use, are large scale and highly professional machines. Since establishment, we have pursued technology while keeping the values of the craftsmanship spirit as a machinery manufacturer for almost a century. We manufacture products consistently through and for the eyes of our clients. We emphasize on easily maintained products where owners can continuously run the machines by merely replacing parts to ensure long operating life. From then and now, inexpensive machines have drawn attention due to the clients’ preferences of using the same devices for extended periods of time. The operational life of a product is the universal merit for all consumers, therefore many continue to choose our handcrafted products. Welding work is required in the production of boilers which has and still been utilized through the hands of our professional artisans. Due to the environment that boilers are used in, a high degree of precision is necessary. For instance, if a boiler used in a vessel was not constructed properly, problems such as explosion or worst case scenario, capsizing may occur. 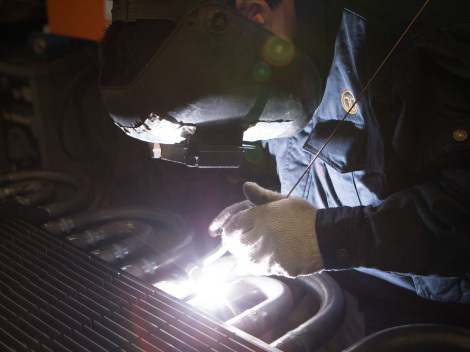 Therefore, emphasis on welding work must be accurate with no room for error. 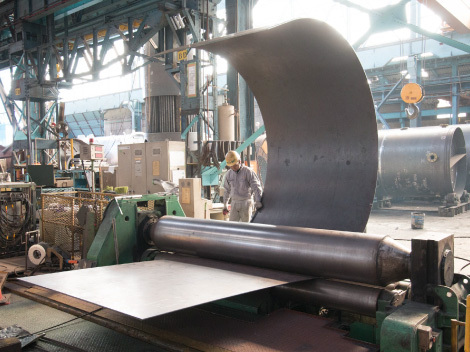 The buildup and succession of such skill is an important corporate value for Osaka Boiler. The installation of testing equipment, boiler factories (approved by the Ministry of Health, Labor and Welfare), and endorsements from the Class NK and many other quality recognition around the globe, are also the advantages of Osaka Boiler. Such objective approvals were acquired from the skills generated by our handwork and the backbone of our company. Since its establishment in 1925, Osaka Boiler developed together alongside the shipbuilding industry. 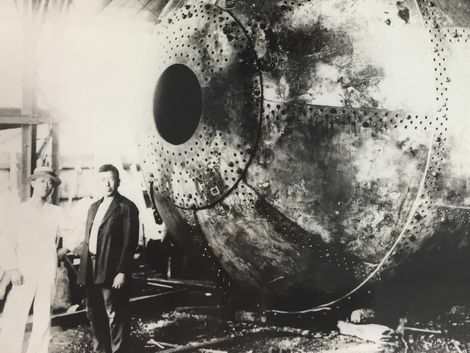 The history of Osaka Boiler dates back to 1925. and we have been producing boilers ever since. We operated through the advancement of the manufacturing businesses of Japan meeting the needs of the industry unconditionally. As the shipbuilding industry made dramatic advances during the years of steep economic growth, we began focusing on marine boilers. Although marine boilers continue to be our flagship products, we are also committed to autoclaves for land use and power generating facilities to meet the new needs of the era. We have obtained countless experience from our long history. Our responses are prompt and adaptable because of the know-hows acquired through the century highly valued by our clients. As our history progresses, the trust and expectations of our clients become higher. Therefore, we will continue to hold quality, delivery and trust acquisition as an important factor. The advantage of being a one-stop company is that everything is done in-house, from accepting an order to the delivery of products. Once our sales staff receives an order, everything from the design, manufacturing, inspection, shipment will be done by us. Being capable of carrying out the entire process within the company is our strength. We inspect products with our equipment before shipping for delivery. We are able to move information, communicate details, and make fine adjustments smoothly with our in-house team. Although this factor may seem insignificant, we consider it as a huge advantage for quality control and shipment, to further live up to our clients’ trust and expectations. Manufacturers of Japan have always sought for additional values while realizing them at the same time. With this spirit, we strive to pursue other values much needed for today such as energy-saving performances and environmental-friendly features. It is our goal to create an energy efficient system that reuses heat from the exhaust gas and comply with environmental control standard on a global level. We will continue to fulfill client’ expectations with the high values of our skills and development capabilities. We have also installed solar photovoltaic cells on the rooftop of our office building to promote environmental efforts further.